Giving his New Year press conference in Seoul Wednesday, Moon added he would be willing to sit down with North Korean leader Kim Jong Un in the future, but wouldn't have "a meeting for the sake of a meeting," calling for Pyongyang to move towards denuclearization. "War must not break out on the Korean Peninsula again," Moon said. "My goal is to resolve the North Korean nuclear problem and solidify peace during my term." On Tuesday, following a long day of negotiations at the demilitarized zone between the two Koreas, Pyongyang agreed to send a delegation to next month's Winter Olympics and to hold talks with Seoul to ease military tensions. Ahead of the talks, Trump took credit for creating the right conditions for dialog in a tweet: "Does anybody really believe that talks and dialogue would be going on between North and South Korea right now if I wasn't firm, strong and willing to commit our total "might" against the North. Fools, but talks are a good thing! 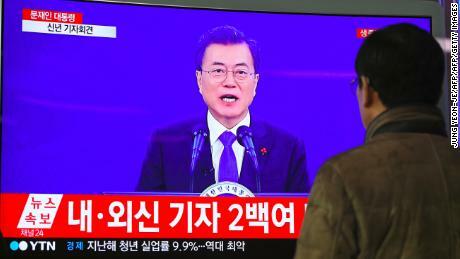 "While Moon praised the US and the international community for putting pressure on North Korea, the South Korean leader also expressed concern this "could raise tensions and bring about unintentional clashes." "Therefore, we need to have a deep consideration regarding how we would appropriately manage these tensions, prevent unintentional clashes and establish dialogue with North Korea," he said. "South and North Korea have decided to make joint efforts for the unity of the people and reconciliation by establishing an environment for peace and easing military tensions on the Korean Peninsula," the two countries said in a joint statement. Moon praised Trump personally, saying he "made a huge contribution to make inter-Korean talks happen (and) I'd like to express my gratitude. "His assessment of Trump's contribution to the diplomatic breakthrough contrasted with the view from Pyongyang, from where the state-run Rodong Sinmun newspaper on Monday criticized Trump for "boasting of 'diplomatic success,'" although it didn't mention the negotiations.North Korean state news agency KCNA made its first direct mention of the talks after they wrapped up Tuesday, saying they took place "amid great expectations and interests of all the fellow countrymen and people at home and abroad." In a speech which focused on economic and social issues — including tackling unemployment, working hours and suicide among young people — Moon drew a connection between his administration and the candlelight protests which helped drive President Park Geun-hye from office following a corruption scandal. Moon, who won 40% of the vote in an election to replace Park after she was impeached, drew a large amount of his support from the candlelight movement, many of whom were younger, more liberal South Koreans. He has pledged to crack down on corruption and seek to reform the chaebols, the huge family-run conglomerates that dominate South Korea's economy. Predictably however, questions at his press conference Wednesday focused on the North Korea issue. During the campaign, Moon advocated for greater engagement with Pyongyang to reduce tensions, and as leader he has had to walk a delicate line between North Korea and the US. Relations with Washington appeared to be hurting as Pyongyang continued its missile and nuclear testing, with Trump at one point accusing Moon of seeking "appeasement" with North Korea, though relations improved considerably during the US President's trip to Seoul late last year. Later, Trump agreed to suspend joint military drills for the duration of the Pyeongchang Olympics, as an apparent good will gesture. "The US and South Korea are in very close cooperation," Moon said Wednesday, adding the countries are in agreement on their policies "against North Korea, especially on North Korea's nuclear and missile provocations. ""There is no difference in our opinions with the US, which is why the US is fully supporting (Tuesday's) talks, expressing their wish this can help resolve the North Korea nuclear issue," he added. CNN's Taehoon Lee and Sol Han contributed reporting. An elderly woman with Alzheimer’s disease was raped on her bed by two young men in a horrific crime ..
As a constitutional crisis continues to unfold in the Maldives, India, China and Saudi Arabia have a..